It doesn't seem like the kind of album title Ozzy Osbourne would choose, necessarily. But according to a report, Ozzy has settled on a name for his next album that's left a lot of longtime metalheads scratching their heads ... and wondering if Oz is collaborated on the disc with Fred Durst. Apparently, he's picked 'Soul Sucka' as the name of his next album. Seriously. 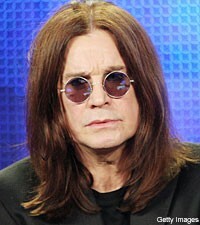 'Soul Sucka' is the follow-up to Ozzy's last LP, 'Black Rain,' which was certified gold by the Recording Industry Association of America in 2007. The album has shifted more than 500,000 copies in the United States alone. In its first week, 'Black Rain' sold 152,000 units, which was enough for a #3 debut on Billboard's Top 200 albums sales chart. The news comes months after Osbourne's highly-publicized split with longtime guitarist Zakk Wylde. Wylde recently underwent treatment for blood clots and called his split with Ozzy "no big deal."